He who was known as Dhritarashtra born of the seed of Krishna-Dwaipayana, and gifted with long arms and great energy, also a monarch, of the prophetic eye, became blind in consequence of the fault of his mother and the wrath of the Rishi. His younger brother who was possessed of great strength and was really a great being known as Pandu, devoted to truth and virtue, was Purity's self. And, O king, thou shouldst know that he who was known on earth as Vidura, who was the first of all virtuous men, who was the god of Justice himself, was the excellent and greatly fortunate son of the Rishi Atri. So my question is - Is it mentioned anywhere in the Mahabharat or any other scripture what the previous births of these two sons of Ved Vyas were? The Devi Bhagavatam mentions Dhritarashtra as the reincarnation of an Asura called Hamsa, the son of Nemi. Nothing is mentioned about Pandu. 30-32. Vâsudeva was the part incarnation of Kas’yapa, Devakî was of Aditi, Baladeva, of Ananta; Vâsudeva S’rî Krisna, of S’rîmân Nârâyana; the son of Dharma existing even at that time in his physical body; Arjuna, of Nara, the younger brother of Nârâyana. 33. 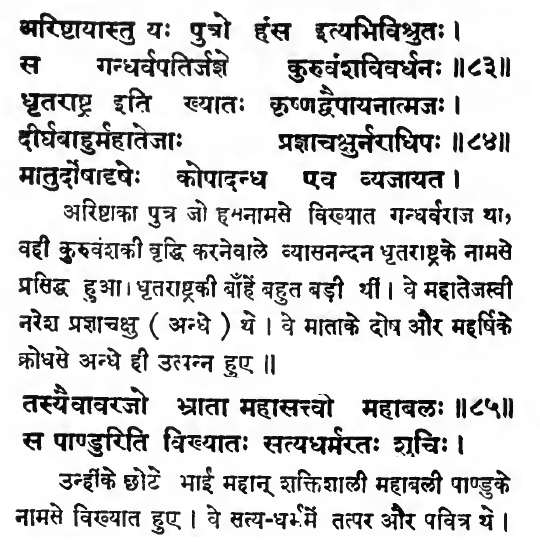 Yuidhisthira was part incarnate of Dharma, Bhimasena, of Vâyu, the powerful twins of Mâdri, Nakul and Sahadeva, of As’vinî-kumâras? 34. The valiant hero Karna, born of Kuntî, was part incarnate of the Sun, and the high minded Vidura, the knower of the Supreme Essence, was incarnate of Yama, the king Dharmarâj. Drona, the Âchârya of the Kurus and the Pândavas was the part incarnate of Brihaspatî; and his son As’vatthâmâ was part incarnate of Rudra Deva. 35. S’antanu was the part incarnate of the Ocean; his wife, of the river Ganges in human form. It is stated in the Purânas that the king Devaka was part incarnate of the Lord of Gandarvas. 36-41. The Grand-father of the Kauravas, the foremost of the heroes, Bhîsma Deva was the incarnate of Vasu; Virâta, the Lord of Matsya was the part incarnate of Maruts; Dhritarâstra, of the Daitya Hamsa, the son of Arista Nemi; Kripa and Krita Varmâ, of Maruts; Duryodhana, of Kali and S’akuni, of Dvâpara; Suvarchâkhya Somapraru, of the son of the Moon; Dhristadyumna was part incarnate of Fire and S’ikhandî of Râksasa; Pradyumna was part incarnate of Sanatkumâra; the king Drupada was part incarnate of Varuna; Draupadî, of Laksmî; Draupadî’s five sons, of Visve-devas; Kuntî was incarnate of Siddhi; Mâdri, of Dhriti; Gândhârî, of Mati; the wives of S’rî Krisna were the heavenly public women; thus all the Devas came as their part incarnations, urged on by Indra. From the Purana's 4th's Book's 22nd Chapter. Whose incarnation Dhitrashtra was is mentioned in the same chapter from where you have quoted the reference in your question. It is just mentioned in the previous line of your question's text. And for Pandu, it's mentioned in your question itself but as you have missed previous line, it's not clear. This answer mentioned under the question What were the previous births of the characters of Mahabharata? says "Vyasa's son Pandu was apparently the incarnation of the god of Purity". However, this doesn't seem to be correct as Sanskrit shloka mention truth, dharma etc as Pandu's qualities. This Wikipedia article also says that Pandu was incarnation of Younger brother of Gandharva Hamsa. Dhritarashtra was incarnation of the king of the Gandharvas is confirmed in Mahabharata: Svargarohanika Parva too.